Breast Cancer Awareness Month is in October and breast cancer awareness bracelets are in high demand during this month of awareness and campaigning against this epidemic. Many of our customers are active in the fight against breast cancer and choose to create custom silicone breast cancer wristbands to promote awareness for the disease. Some choose to purchase these pink awareness custom wristbands in bulk as a way to help raise funds for organizations and others buy our wristbands to show support for individuals whom they know are battling breast cancer. 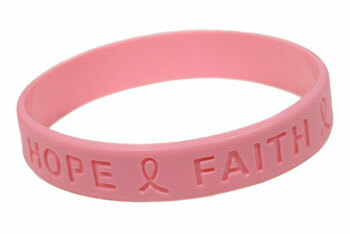 Many customers use the pink ribbon known to identify breast cancer awareness on the ink-injected bracelets in a darker pink so it can stand out on the band while others prefer the classic debossed wristbands and let the pink band speak for itself while the awareness ribbon and message stay subtle. However you choose to design your breast cancer bands you can rest assured knowing you are purchasing 100% latex-free silicone wristbands that will last for years to come. If you need help designing your cancer wristbands you can always call a Make Your Wristbands Specialist at (800)715-4445 – we are happy to answer any questions you may have about the process of creating your customized bands and to guide you to ensure your satisfaction with your custom wristband purchase.